Army SSG Robert Canine was a truck commander returning from a patrol in northwest Baghdad in May 2009 when an Explosively Formed Projectile (EFP) blasted into his vehicle leaving him with injuries so severe that both of his legs required amputation. First transported to a field hospital, SSG Canine was then taken by Blackhawk helicopter to Balad before arriving in Landstuhl, Germany where he fell unconscious. 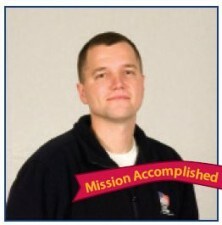 Five days later Robert awoke at Walter Reed Army Medical Center and began his road to recovery. SSG Canine enjoys spending time with his teenage son, Sebastian. He has always enjoyed playing football and watching baseball. He also enjoys fishing with his son. Robert is pursuing a bachelor’s degree in business administration with hopes of finding sustainable employment. Since receiving his HFOT home in June 2010, Robert has grown his family and started working as a Veterans Service Officer at the Disabled American Veterans branch in St. Louis.